HAVE YOUR BIRTHDAY PARTY AT GLOBAL! and 45 minutes of birthday celebration in our party area! Children who attend a Global birthday party will get an action-packed hour of physical fun! We understand the importance of a child’s birthday and will do our best to make their party unforgettable! Party activities are customized based on the birthday child's age and include gymnastics activities. 45 min in our party room! Note: Tuition paid for camps, clinics, and parties may not be used as credit for tuition for non-attendance. Refunds may be issued on a case-by-case basis. If refund is allowed, there will be a 20% non-refundable portion to cover administrative, staffing, and supply expenses. What is required to schedule my child's birthday party? A $50 deposit is required when reservation is made (or at least two weeks prior to party date). Your deposit amount will be applied toward the total price of the birthday party. Payments can be accepted in person or by mail (Mailing Address: 1006 E State Street Ste D, Athens, OH 45701). How soon should I schedule the party? We suggest you book your child’s birthday party at least one month in advance; however if you want a specific date and time we suggest at least six weeks in advance. What should party participants wear? Guests should wear comfortable clothing with NO buckles or zippers. No jewelry is allowed. Children with long hair should have it pulled away from the face and off the shoulders. Do party guests need a permission slip in order to participate? Yes. 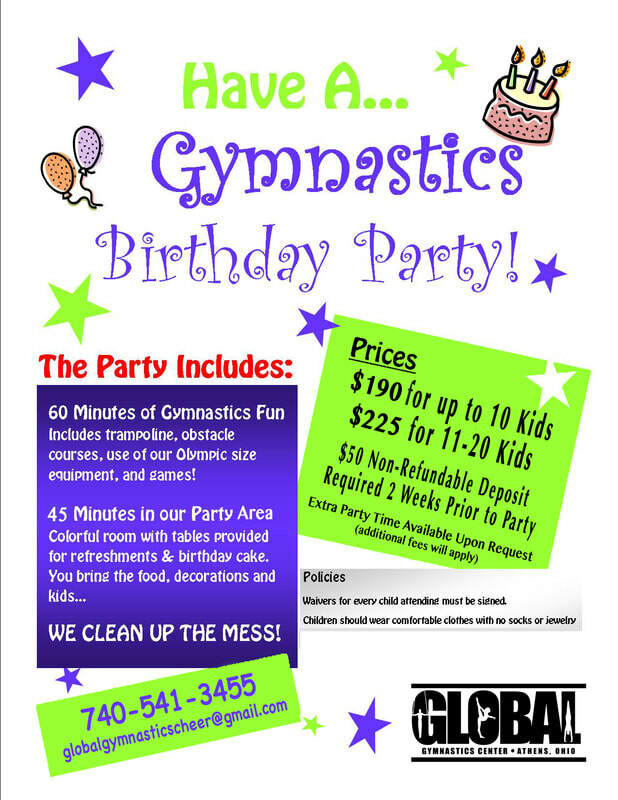 Global Gymnastics requires that all party participants bring a signed Birthday Party Release Form. You may include them with your invitations or guests may print one from our website. We will also have them available on the day of the party. Form is available for download below. Can we add additional time to the party? You may add additional party time. The cost is $20 for 15 minutes. Request must be made at time of party booking. Are we allowed to bring food and drinks for our party guests? You are welcomed to bring most anything for your party guests (decorations, snacks, drinks, etc.). Just remember that you have 30 minutes of party time so if you are providing a meal you may want to add extra time to the party. Absolutely, no alcohol is allowed.